Before drawing attention to the cards, secredy get the deck into the needed condition as follows. Get a left fourth-finger break slightly above the mid-point of the deck. Half-pass all the cards below the break. Then double undercut the top card to the bottom of the deck. (During the cutting sequence, you must take care not to cut into the face-up portion of the deck.) You will now have slightly less than half the deck face down followed by a face-up block, followed by one facedown card on the bottom. You now draw attention to the deck as you explain that you Ye going to shuffle the cards in such a way that no one can doubt that they will be well mixed. As you say this, fan the deck. Actually, you execute a move of mine I call the biased pressure fan. 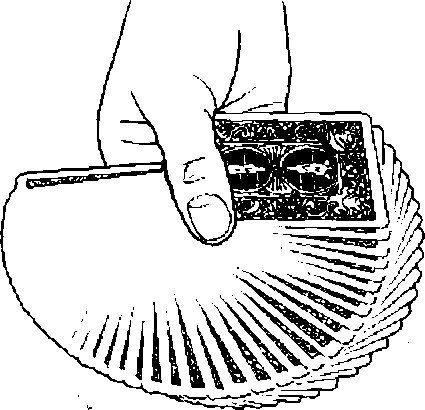 Because of this bevel, when you make the fan, you'll find that you are really only fanning the top half of the cards. The bottom portion remains grouped together, the white edges of the face-up cards blending with the white borders of the facedown cards. Backs should show for the top three-quarters of the deck, tapering off into a block of white for the last one-quarter. One last point: As you start the fan, sidejog the bottom card slightly so that a bit of color shows on the bottom. The overall result is a fan that very convincingly shows a facedown deck as in illustration 2. Tm going to give these cards a shuffle," you explain. "But I want, to make it obvious that it will be a thorough shuftle. The top cards wiU mix with the bottom cards; the middle cards iwiil mix with both top and bottom." As you deliver these lines, point to different parts of the fan. The idea is to point up the apparent facedown condition oi the entire deck without saying so. Use this top half to flip the bottom half "face up." (Actually, the bottom half will be face down except for the top and bottom cards.) Faro the two halves together. This shuffle need not be anywhere near perfect. You must, however, ensure that the top and bottom cards of the lower half become the top and bottom cards of the deck. Since the bottom half is slighdy larger than the top half, this should work out automatically. Comment about the face-up/facedown condition of the deck. As if to illustrate your point, double undercut the bottom card to the top. Both facedown and face-up cards will show during the cutting. At this point you will have two face-up cards on top of a facedown deck. Draw attention to the identity of the top card. Let's assume it's the four of hearts. 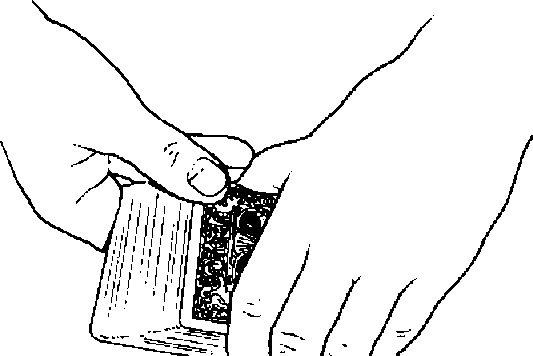 Perform a double turnover and place the top card on the bottom of the deck. Perform a magical gesture and show that the four of hearts has returned to the top. Finally, say, "Bui the. 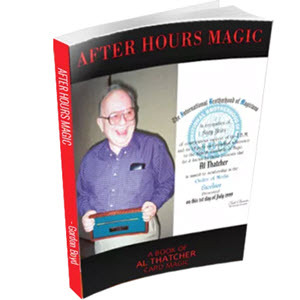 really amazing thing is that, in the act of traveling from the bottom to the tofi of the deck, the four of hearts has managed to straighten out every single card in the deck—all face down—¿very single one." As you deliver the last part of this line, slowly spread through the deck to reveal the truth of your statement.